Really neat concept. The execution is pretty decent, but it felt kind of opaque to me at first. The explanation of hacking doesn't really give enough detail that I understood what I was doing at first. I kept trying to go up to the turrets to hack them, which just resulted in me dying a bunch. Thanks for playing and the feedback! Yeah I can see that, I originally had "Left click to shoot turrets" but wanted to make it themed a bit more to match the story, so changed it to "Left click to hack turrets". Definitely needs a bit of tweaking. Think it probably needs more feedback on dying, cause feel like some people might die and not realise why. Very good work. Excellent gameplay. With a few improvements it will be highly addictive. Well Done, the concept is interesting and I had a good time playing it. On a side note, I think the game would benefit from some feedbacks when the turrets are hacked. You maybe went a bit too far with the post process, the grain was a bit too strong for my eyes. Nice entry! Thank you! Yeah, more feedback is always good, definitely would want feedback (especially audio, seeing as there isn't any audio as far) with every interaction between objects. Ahah yeah, just for this demo I learnt on the side of more grain because it's shorter but recognise that over long period would become irritating. Wouldn't be too hard to have options for all post processing features available in the future so people can tweak how they want! Very nice puzzle/shooter combo, I enjoyed playing it! If you continue development in the puzzle direction, make sure the solutions are clear works-or-doesn't-work and less button-mashing-until-it-works, to balance exploration and thinking and make solving a level much more satisfying. Thanks! Yeah that came up in the brief playtesting I did, and the turrets doubled in size as a quick fix to try and fix this problem. Definitely think that having different shaped turrets to cover more surface area would fix this. Very cool, would love to see more. 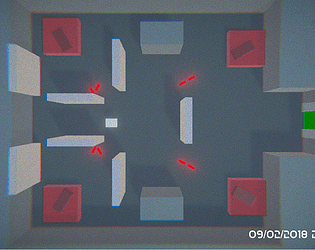 Maybe speed up character movement a little and try some less symmetrical level design? Thanks! Yeah, that's already changed in my build, but can't update jam one. Yeah I was finding the level design a little bit hard as its not my forte, would have to sit down for a while and think about them! Ahh that's good to hear as another mac user was having trouble and I didn't want loads of people to have issues. Cheers! Very fun! Struggled with the last level - challenging! Oh might be an issue with Macs then, im sorry! Neat! I can definitely see where you could take this idea and run with it for a full-fledged action-puzzler. Thank you! I was thinking of a load of concepts and then thought of this one and immediately loved it. I like it! only thing wrong with it is the insanely long transitions when you die. You can't get right back into trying something else when you die. I just replayed it, and I managed to get stuck in a wall on the last level. For the bug to happen, when you spawn in, just walk left, and when you hit the wall, you'll clip into it and can't get back out. Great to see you playing again! oh wow, there definitely is something funky happening with the walls, strange. It was fine when I made them but i guess i must've changed something at some point and they broke. weird. Thanks for testing and notifying me!